A marvellous piece of architecture which can be admired only from outside on account of security restrictions. Close to Rashtrapathi Bhavan,it is a domed almost circular structure almost a kilometer in circumferance, and was designed by the famed architect Lutyens. It is the seat of the Indian Parliament and during the sessions of Parliament there is a flurry of activity in and around the structure. Almost a stones' throw away from Parliament House is the Rashtrapati Bhavan which is the official residence of the President of the country. Designed by Lutyens, it was the official residence of the Viceroy when the British ruled India. With 340 rooms and an area of about 330 acres. It is an imposing structure and a tourist's delight. The pillars and the porticos are an architect's marvel and so are the Durbar Hall and the Ashoka Hall within the complex. Although special permission has to be obtained to visit the complex, the Mughal Gardens within the complex are a treat for the eyes and are open to the public during certain periods of the year. Situated within the President's Estate, these gardens boast of the finest varieties of roses in the country besides other flowers which are maintained with the utmost care and thought. The lawns of the gardens is the place where the President hosts tea parties.One of the most interesting sights is the fountains illuminated with multicoloured lights. Straight down the road from Rashtrapati Bhavan along a magnificent view and totally unhamnpered drive is the India Gate which is primarily a memorial to the unknown soldier. Designed by Lutyens, the 42 metre high structure is a war memorial in honour of the soldiers who died during the second world war. The imposing structure from where stretch massive lush green lawns has an eternal flame (amar jawan jyoti) to honour the memory of the unknown soldiers. A popular picnic spot, one can see hoards of people moving about the area and on the lawns on summer evenings. One of Delhi's most popular shopping centres built as early as 1931 there is nothing that one cannot buy here and it also has several eating houses which are for a large part of the day dull. The state emporia buildings are also located in this area so are the head offices of major banks, airlines and other such things of importance to the tourist. The complex, popularly referred to as C.P. is an important meeting point for all sections of people and is something which no tourist should miss if for nothing else then for its architecture and the humdrum of everyday life. Located very close to India Gate, the building was the palace of the Maharaja of Jaipur. It has around 4,000 paintings of modern artists and also included are graphics and sculptures. The gallery arranges special exhibitions for those who wish to exhibit their works. The gallery also houses a library which can be used by museum, which is open from 1000 hours to 1700 hours, is closed on all holidays and observes Monday as its weekly off. The National Museum is another interesting spot located very close to India Gate. The museum has a rich variety of all facets of ancient Indian history and alsoof central Asia. In fact the museum takes one through a fascinating journey of what ancient India was all about, rare coins, pottery, and numerous such things including art and architecture, costumes are for all to see. It's something every tourist should find time to visit even if the schedule is tight. This is another landmark close to Connaught Place and was built by industrialist Raja Baldev Birla in 1938. The temple is an important prayer site and contains idols of several deities. Interestingly Mahatma Gandhi, who inaugurated the temple, was also a regular visitor to it and would often pray there. Is a very recent architectural marvel of the Bahai faith (founded from Hinduism and Islam) and is visible from several spots in south Delhi. 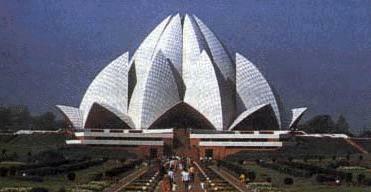 Located in Kalkaji in the south of Delhi, it is lotus shaped and has rightly been given the name. It is made of marble, cement, dolomite and sand. It is open to all faiths and is an ideal place for meditation and obtaining peace and tranqillity. Again in the south of Delhi near the Indian Institute of Technology on the road to Meharauli it has literature on the life of Sri Aurobindo and the Mother and has an ashram where devotees can come to meditate. There is also some accomodation available for devotees of Sri Aurobindo. It was the official residence of Jawaharlal Nehru when he was the Prime Minister and after his death it was converted into a museum. Through pictures and other literature, the various facets of the life of Pandit Nehru have been shown.